Fertilizer and soil additives are exactly that....different substances that are added to your regular feeding program for various different benefits. In a hydroponic garden your basic feeding program will usually consist of a three part hydroponic fertilizer, which provides all of the primary nutrients, secondary nutrients, and micro-nutrients required by the plants. This page will describe a few of the very best nutrient additives you can use, and why you should be using them! One of the best fertilizer and soil additives is a quality vitamin B1 supplement. Put a little of this in every drop of water you give your plants (same with liquid seaweed). Just like vitamins for people, B1 helps every cell of a plant feel and perform its best. About 10 ml of B1 per gallon of nutrient solution is enough to continually pump up the vigor of your plants and drive cell division (which means increased growth rates). The results I get have made me a big fan of Thrive Alive, but Superthrive is another popular choice. Another one of the best fertilizer and soil additives is bat guano. Bat guano contains a huge number of beneficial micro-organisms that work to improve the soil. The nutrients in bat guano are also immediately available to your plants. These are two reasons bat guano is used in soil mixes, and also in making nutrient tea. Any time you have a large population of micro-organisms you will be improving your soil conditions as they break down organic matter in the soil and produce humic and fulvic acids, and living enzymes. When your plants are young, you should rely more on worm castings as a fertilizer and soil additive. As you transplant into larger containers, incorporate about 1 tablespoon of bat or seabird guano into each gallon of soil. Add to this 1 tablespoon of kelp meal to each gallon of soil, so your micro-organisms will have plenty of carbohydrates to feed on. Use a bat guano high in Nitrogen when in the vegetative stage, and a bat guano high in Phosphorus when in the flowering stage. I do not recommend blood meal as one of your fertilizer and soil additives. Blood meal is literally dried blood scraped from the slaughterhouse floor. You should always wear a mask if you decide to use it in a soil mix, as the dust can make you very sick. Blood meal is a very rich source of Nitrogen and is immediately available to your plants. Use it at a rate of one rounded tablespoon per gallon of soil mix. Since it is mostly Nitrogen (the first number), it is mostly used for the vegetative soil mixes. I have stopped using blood meal as one of my fertilizer and soil additives since the advent of Bovine Spongiform Encephalopathy (BSE). Instead, I compensate with extra worm castings (no more than 20% of the total), high Nitrogen bat guano, alfalfa meal, or replace the missing Nitrogen with some other high Nitrogen additive. I also do not recommend bone meal as one of your fertilizer and soil additives. Bone meal is the other slaughterhouse product. Bones are stripped, dried, and ground into a fertilizer that is high in Phosphorus (the middle N-P-K number) and Calcium. A portion is immediately available to your plants, and a portion is released slowly to your plants. If you decide to use bone meal, use a mask when preparing the soil mix. Use one rounded tablespoon for each gallon of soil. Bone meal is usually used in soil mixes that are going to be used during the flowering/fruiting stage. I have stopped using bone meal as one of my fertilizer and soil additives since the advent of Bovine Spongiform Encephalopathy (BSE)...scary stuff. Instead, I compensate with a little extra high Phosphorus bat guano or special bloom additives. Be careful with special bloom additives....their Phosphorus levels can sometimes be very high. The higher the number, the easier it will be for the fertilizer to burn your plants (and possibly kill them). Enzymes provide a missing link in the availability and use of fertilizer and soil additives. Enzymes control certain processes, much like plant hormones do. Enzymes are like traffic cops, signaling for molecules to move and processes to take place. A plant with no access to enzymes is like a having a construction crew, all the materials for a job, but no blueprint and no foremen. Beneficial micro-organisms produce enzymes. They break down organic material and produce enzymes and humus. They live in the soil, in worms, in seabirds, in bats, and everywhere. Micro-organisms are the secret behind compost, bat guano, and worm castings and why they work so well. Every living thing uses enzymes to function. Having them available in good quantity ensures the most efficient growth of your plants. A great source of enzymes would be worm castings and compost. If you have the time, you can make your own compost, or brew your own compost tea. These are all great fertilizer and soil additives. One excellent compost tea fertilizer is Pure Blend. The key is to always have a healthy population of micro-organisms. Using kelp meal and seaweed products will give micro-organisms plenty of carbohydrates to feed on, helping to grow a big, healthy population. Finally, the best quality enzyme supplement would have to be Hygrozyme. Use it regularly, in small amounts. Follow the directions. It is beneficial to all stages of plant growth, and if you carefully maintain a healthy micro-organism population you can use half as much to get the same results. Works great as both a fertilizer and soil additive. You use humic and fulvic acids in small amounts consistently throughout the life of your plant. Plants treated in this way grow larger and healthier roots, faster vegetative growth, and more vigorous flowering. They also tend to improve the flavor and aroma of your garden produce. One excellent source of humic acid is Liquid Karma, which is about 20 percent humic acid. A quality source of fulvic acid would be Diamond Nectar. If using them both, use only half strength of each. Even when fertilizer is available, your plants still must process molecules to a small size before they can be absorbed. Plants can only do this so fast. Humic and fulvic acids are powerful chelating agents. This means they quickly change nutrient molecules into smaller, more usable forms, which allows your plants to absorb more nutrients more quickly. The use of humic and fulvic acid makes the root zone environment more closely resemble that of soil. This makes it one of the most important fertilizer and soil additives if you are gardening in a hydroponic system. Humus (the waste or decomposed remains of living things) is the source of organic material. Humic acids are the essence of humus. Fulvic acid is the most active portion of the humic acids. Obviously, humic and fulvic acids contain much organic matter and many minerals that are beneficial to your plants. Your micro-organisms do their best at a pH of about 7. Your plants have the greatest nutrient availability (from a chemistry standpoint) at a pH of 6.2 in soil. In between lies your perfect soil pH. Most commercial potting soil mixes are based on sphagnum peat moss, which is a little too acidic. If your mix is sphagnum peat based and it has not already been pH adjusted, add about 1 teaspoon of hydrated lime for each gallon of soil mix. This also supplements the mix with a little extra Calcium and Magnesium (which is great for preventing blossom end rot). In a hydroponic system, a supplement such as Cal-Mag does the same thing that hydrated lime does in soil....it adds additional Calcium and Magnesium to the nutrient solution. Because high quality hydroponic nutrients already include some small amount of Calcium and Magnesium, you will rarely find yourself with a nutrient deficiency if you are NOT using a Calcium-Magnesium additive in your hydroponic system. 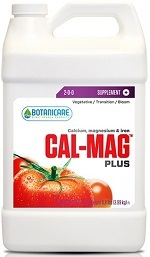 However, plants tend to put on more fruit and flower weight when they ARE given a quality Cal-Mag supplement. I find this supplement is especially useful in soil gardens. If the soil in your garden was prepared without a good source of Calcium or Magnesium, you may find yourself growing many small tomatoes, squash, and zucchini that begin to rot shortly after they begin to grow. If these veggies are rotting before they reach maturity, your problem is one of two things....there is either not enough Calcium and Magnesium in the soil, or the soil in your garden is too acidic (making the Calcium in the soil unavailable to your plants). First, check the pH of your garden soil with a cheap soil pH test kit. If your garden soil has an acceptable pH, then your problem is almost certainly a Calcium or Magnesium deficiency. Mix into your next batch of fertilizer according to the directions on the bottle and cross one more garden problem off your list! You would use a liquid seaweed, like Maxicrop, in small amounts every time you water. It is also an excellent choice for foliar feeding. The low N-P-K numbers let you know you can use it every time without worrying about burning or nutrient buildup. Also, seaweed based products need very little pH correction. Plants absolutely need minerals and organic matter to live. Seaweed is amazingly complete in trace minerals (aka micro-nutrients). Used weekly as a foliar spray, you will prevent any nutrient deficiencies. Seaweed also contains a healthy dose of usable plant hormones, which drive plant growth and ensure proper development. Kelp meal is added to a soil mix for the plant hormones, and also to provide a good source of carbohydrates. Your plants take up and convert carbohydrates into their own plant tissue. In addition, the carbohydrates make a good food source for beneficial micro-organisms, and support large populations. Seaweed fertilizers like Maxicrop also incorporate a versatile range of N-P-K ratios, like 16-16-16 or 3-20-20, making it a great fertilizer for just about any purpose. With a solid N-P-K ratio, micro-nutrients, plant hormones, and carbohydrates, a seaweed based fertilizer like Maxsea can almost stand on its own. Check out all the benefits of Maxsea. Maxsea is missing only Magnesium. You can prevent a Magnesium deficiency by adding 1 teaspoon of Epsom salts per gallon of nutrient solution. Silica is one of three additives that I recommend everyone use when growing in a hydroponic system. The addition of Silica creates a crystalline matrix within the stem and branches of your plants, making them thicker and stronger. With the use of Silica, plants become very resistant to pesky insects and plant diseases. The stronger branches not only provide extra support for the plants, but also allow the plants to grow and hold bigger fruits and flower sets without damage. 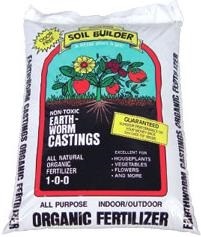 Worm castings are one of the best fertilizer and soil additives. Worm castings are mostly Nitrogen, and it is in a form the plants can use immediately. Because the N-P-K values are low it is also a gentle form of Nitrogen, which is important to keep from burning young plants. Most importantly, each casting is coated in living enzymes and beneficial micro-organisms as it passes through the worm. Worm castings should be about 20 percent of your soil mix, or less. Take into consideration that other parts of your mix, like FoxFarm soil-less mix, may already contain some worm castings. Castings are also used by themselves, or with bat guano and other additives, to make nutrient teas. The mayor of a small Washington state town has recently uncovered something shocking and disturbing. Millions of pounds of toxic industrial waste are being diverted from expensive EPA disposal facilities to factories that produce common household fertilizer and soil additives. The products you find on this website have all been thoroughly checked by myself for safety. If you are using any other products, I highly suggest you visit the Washington State Dept of Agriculture website and check the fertilizers you are using for your own safety. To read a more complete version of the facts, go to my toxic fertilizers page.